Vivekananda Kendra Arun Jyoti organized two medical camps in remote villages of Longding district on 6th and 7th June 2018. 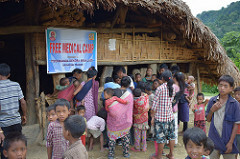 On 6th June the camp was organized at Khanu village of Wakka circle and 145 patients were treated and free medicines were distributed accordingly. On 7th June 96 patients were examined and treated at Longsom village of Kanubari circle. This is to be mentioned that Vivekananda Kendra Arun Jyoti with the support of India development and Relief Fund (IDRF), USA is launching a programme for malnourished children of these two villages. During the medical camps, we selected children for the programme and had meetings with the villagers regarding the programme. It has been decided that nutritious supplements will be provided to the poorly nourished children, initially for one year from next month. The local team of Vivekananda Kendra Arun Jyoti will take care of the whole programme under the guidance of our Mobile Medical Unit. Indoco Remedies Ltd., a pharmaceutical giant of Mumbai donated some medicines for these free Medical Camps.